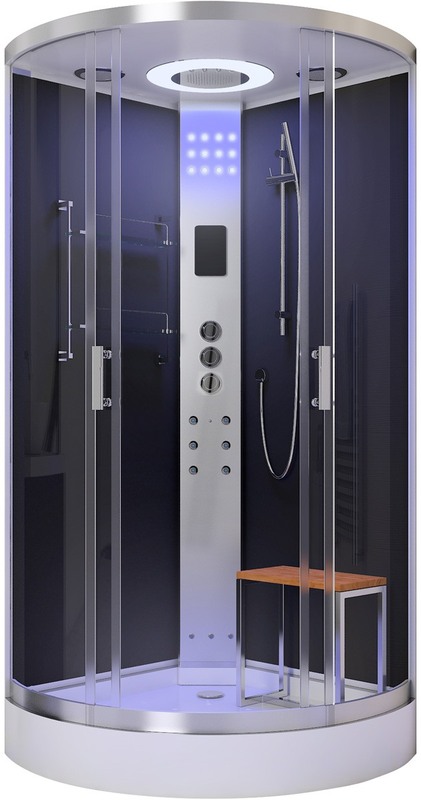 The LW10 900mm steam shower by Lisna Waters is designed to fit into a corner space and comes with Black glass walls and 5mm clear front side panels and doors. This quality shower model has a top monsoon rain shower and removable hand shower on a slider rail plus 6 hydro massage back jets. The 3-dial shower valve a Vernet brand, wax sensor and the efficient 3kw steam generator, is complimented by the new 3-jet steam system. The LW10 has a stylish chrome frame and easy plum reinforced tray and for added benefit, ambient chromatherapy top lighting is also included. With a touch screen control pad, plus a radio with Bluetooth connectivity and of course the Elegance Easy Clean Protection makes this Lisna Waters steam shower a worthy consideration.